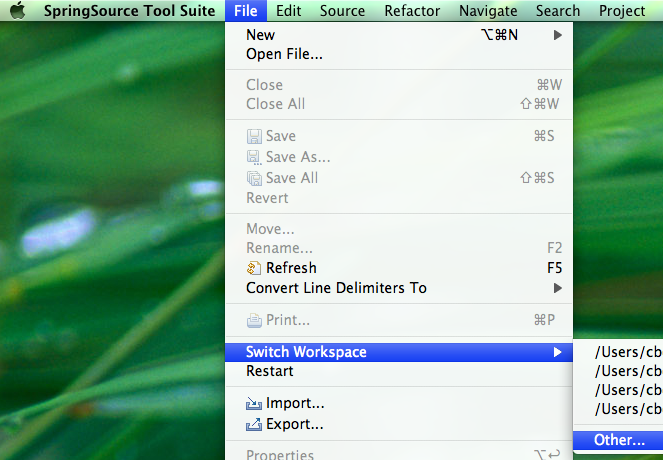 UPDATE - Feb 21 ’12: Spring Framework has moved to GitHub, and for 3.2.x development has moved from Ant to Gradle. Take a look at the building from source section of the README there for (greatly simplified!) instructions. As Juergen announced last week, Spring 3.0 Milestone 2 is now available. In this post, I’ll show you in six steps how to download and build the latest Spring 3 sources and get a development environment up and running in Eclipse. We’ll wrap up by discussing the best ways to follow Spring 3 development, how to file bugs and improvement requests, and considerations for compiling against locally-built Spring 3 binaries in a Maven environment. As you may already be aware, Spring sources are now hosted at springsource.org and, unlike previous versions of Spring that were controlled under CVS, Spring 3 is now managed using Subversion. Before we check out the sources, let’s take a quick look at the layout of the repository. Experienced Spring hackers will notice right away that the directory structure looks a bit different than in previous versions. 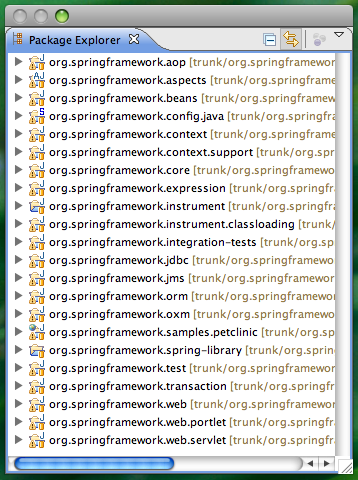 Spring’s internal structure is much more modular now - each of the org.springframework. * directories represents an individual project or module, each with its own respective source directory, test suite and build artifact. This is good news when you’re working on the framework: for example, a change to org.springframework.core can be unit tested independent of the thousands of unrelated unit tests in the other modules. This makes for a much more expedient and pleasurable development experience. It also means that finding existing unit tests tends to be a more intuitive process. Poke around for yourself and see what you think! This initial build will take 20 minutes or more, depending on your connection speed. You’ll notice that Ivy downloads all dependencies transitively and automatically from the SpringSource Enterprise Bundle Repository and this can take some time. 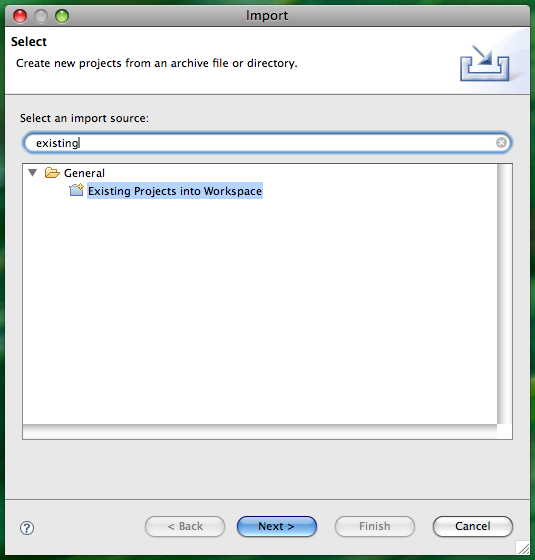 While the build progresses, move on and complete steps 3-5 to set up your Eclipse/STS workspace. 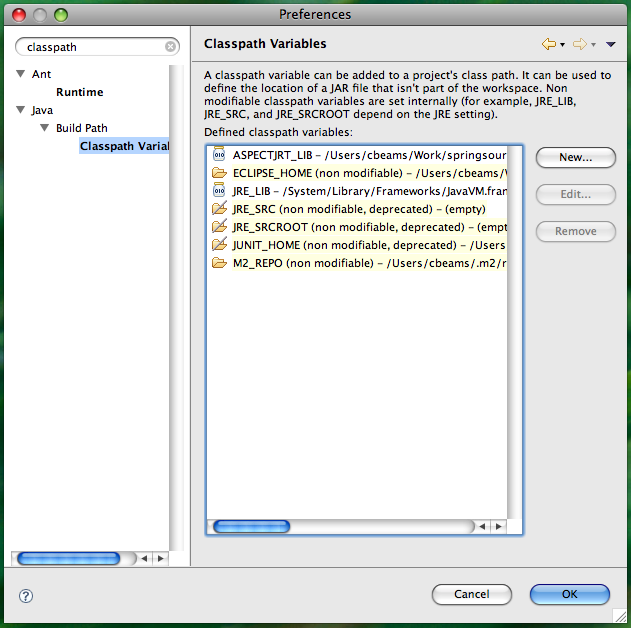 Because we’ll be changing the default JRE and introducing a new classpath variable, it’s recommended that you set up a new workspace in Eclipse dedicated to Spring 3, but it’s not strictly required. If you wish to skip this step and use an existing workspace, move on to step 4. Specify a new location for your Spring 3 workspace. You may choose any directory; as you can see below, I’ve chosen to create a ‘workspace’ directory right within my spring checkout, just for convenience. 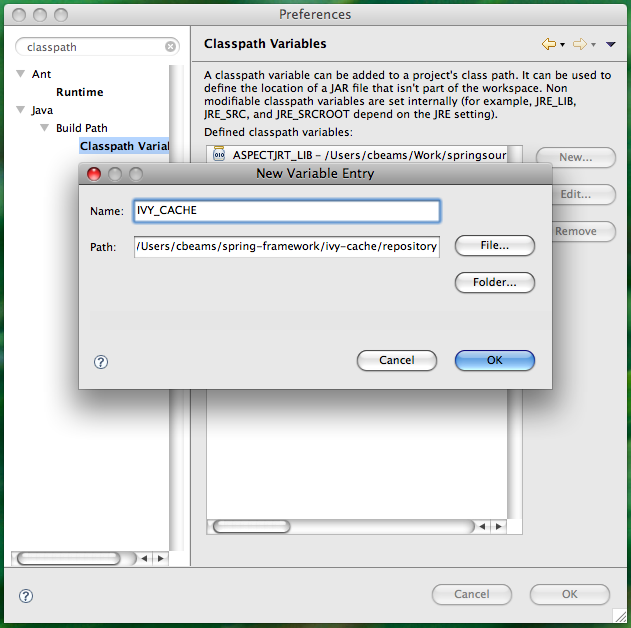 In this step, we’ll create a classpath variable in Eclipse that the various Spring 3 projects will use to determine the location of the jars they depend on. As we noticed earlier when watching the Ant build progress, Ivy is downloading a number of jars - those jars are being downloaded into the ivy-cache/repository directory under the root of your Spring checkout. 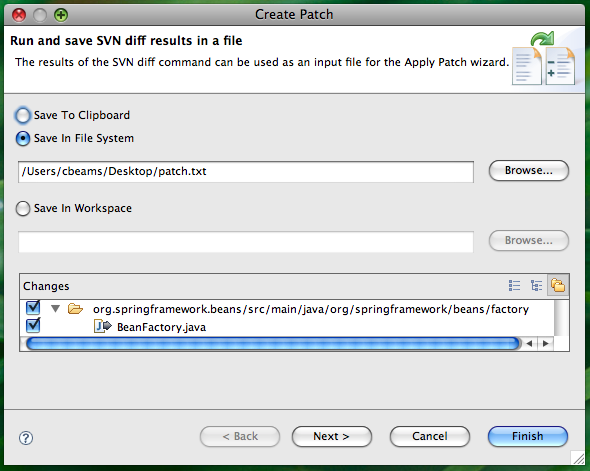 As mentioned above, Spring 3 requires Java 6 to build. The easiest way to ensure this dependency is handled is to simply set the default JRE for your Eclipse workspace to Java 6. If this is already the case for your Eclipse installation, you may of course skip this step. Once again, open the global Preferences dialog. This time, type in “installed JRE” to narrow down the options. Make sure that a 1.6 JVM is selected. 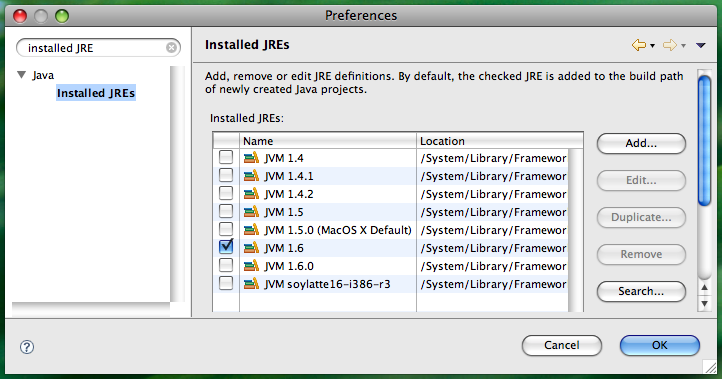 If there is no 1.6 JVM listed in your Installed JREs, click ‘Add…’ and point Eclipse to the location of Java 6 on your system. Remember, your time will vary depending on your connection speed. Don’t be surprised if the initial build takes a while! 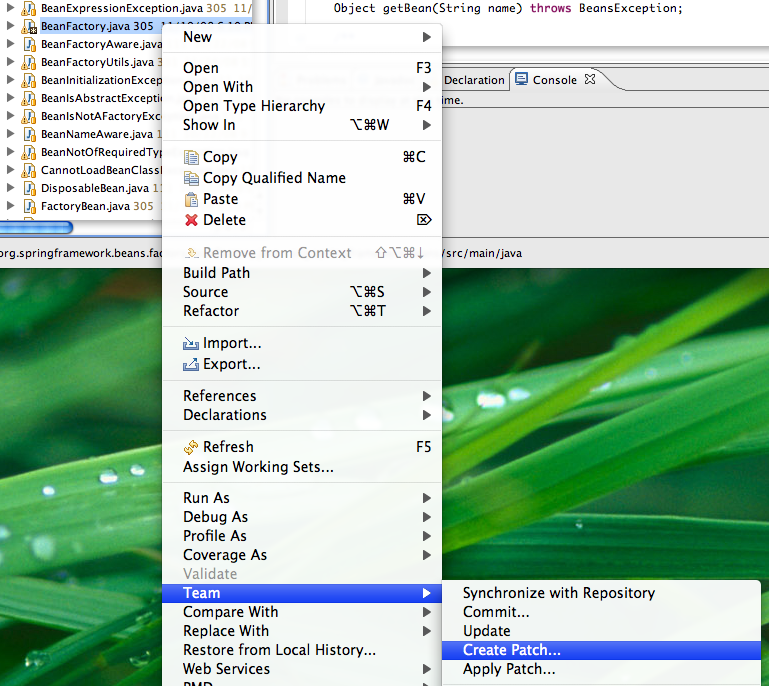 Uncheck the first, unlabeled checkbox and click Finish. Wait while Eclipse imports the projects. When complete, you should see your Package Explorer populated as below, with 22 projects and no errors. That’s it! You’ve now got the Spring 3 sources at your fingertips and you can browse and edit at will. Have fun! The best way to stay in touch with Spring development is to follow the subversion commits via RSS using SpringSource’s Fisheye service. Go to https://fisheye.springsource.org/browse/spring-framework/trunk, and click the RSS icon in the upper right. Note that you can subscribe to any node within the Spring source tree. So if there’s a particular module or even individual package that you care about, you can receive notifications at any granularity you choose. For quick reference, the RSS feed URL to follow all Spring 3 commits is https://fisheye.springsource.org/changelog/~rss/spring-framework/trunk/rss.xml. Add that to your feed reader and you’re good to go. As the milestones progress and we get closer to Spring 3.0 GA, your feedback is ever more important. Should you find a bug or have an improvement request for an existing feature, please take a moment to visit http://jira.springsource.org and create a new issue against the Spring Framework project. If possible, please attach a simple JUnit test case that reproduces any bug. In the absence of that, please provide detailed reproduction steps. Also, when reporting bugs or improvements, please don’t hesitate to take a shot at implementing the change yourself and attaching a patch file. We love getting contributions from the community! 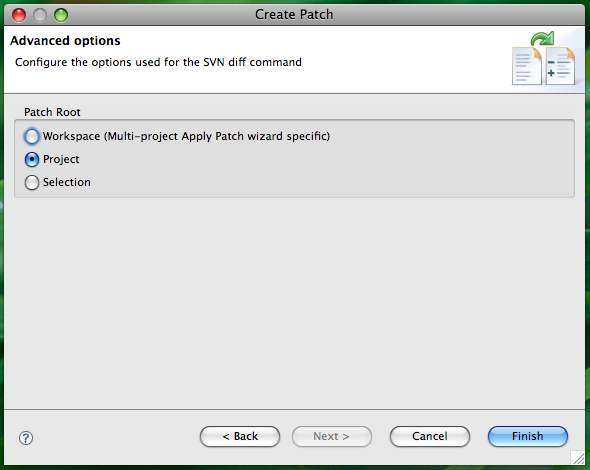 Click Next for advanced options and choose ‘Project’ as the patch root. As a final note, Maven users will want to know how to most effectively install their locally built Spring 3 binaries into their local Maven repository. From the root of your Spring checkout directory, or from within any individual module, you can use the ‘install-maven-central’ target to automate copying artifacts from target/ to your local m2 repository. I hope you’ve enjoyed this walk through the world of Spring 3 development, and I think you’ll find that after the one-time setup detailed above it’s easy to develop against Spring 3 sources. We encourage you to follow development and stay in touch with us via JIRA. Your feedback is and always has been the lifeblood of Spring, and we thank you for it. Keep it coming!